In the world of trying to build muscle we have our own three headed monster to deal with. The three headed monster I am referring to is the tricep muscle. When well developed and strong the triceps can not only give a more powerful look but can aid in giving tremendous power. All power moves of the upper body are aided by the triceps and nothing helps fill out a pair of shirt sleeves than a pair of large bulging triceps. Today we are going to look at a few ways to build our own Ghidorahs. The tricep muscle is made up of three heads. The three heads of the tricep are the Long head, Lateral head, and Medial Head. The long head of the tricep is mostly responsible for pulling the arm down towards the body. It is the longest of the three tricep heads hence the name. It is located towards the bottom side of the arm. The medial head is located pretty much at the midline or side of the body. Every time the arm is extended the medial head is involved. The main function of the tricep is straightening the arm. 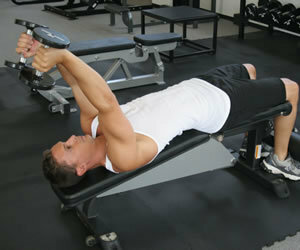 The second main function of the tricep is pulling the arm down towards the body. This function of the tricep is done mostly by the long head of the tricep. Building your triceps is important for a variety of reasons. Whether it be for sports strength or simply cosmetic reasons, there is always a place for tricep training. From a cosmetic point, building your triceps will give your arm a complete look. When most people want to build big arms, they spend too much time focusing on building their biceps. This method of thinking is wrong because the triceps are the muscles that make up the bulk of your arms. Your triceps make up two thirds of your total arms while your biceps only make up the remaining one third. 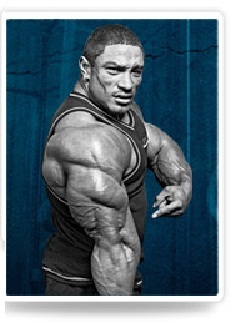 When was the last time you saw someone with huge arms that did not have a pretty good set of triceps on them. Cosmetically, triceps are important to women because as they want to avoid the dreaded back of the arm droop. From a strength standpoint triceps are one of the most important muscles of upper body lifts. All heavy upper body pressing movements depend a lot on the strength of the triceps. Take the sport of powerlifting fo example. One of the big three powerlifting lifts is the bench press. Guess what muscles the bench press relies heavily on? As a matter of fact the tricep muscles are more involved in bench pressing than the pectoral muscles. Show me a powerlifter that does not work their triceps and I guarantee you will also be showing me a not so good powerlifter. Triceps also play a major role in sports. Sports like MMA, boxing and football use a lot of pushing, hitting and pressing of opponents, these are movements are supported by strong triceps. Sports like basketball, baseball, swimming, and golf also use the triceps a lot. Since triceps are so important and used so often, your probably asking well then why don’t most people have better triceps. One of the reasons is because there is a difference between training your triceps and training your triceps correctly for your goals. If you ever go to a commercial gym and look for your average “I just want to keep in shape” female at the gym you will see an example of what I am saying. Some women are almost obsessive with tightening the back of their arms, unfortunately often their training style misses the mark. The problem usually tens to be how some of these ladies go about attaining that goal. It usually is a case of wrong exercise selection for their goals and the exercise selection they mostly get wrong is triceps. Most of these women are mainly concerned with the flab on the back of their arms but 9 times out of 10 are using the wrong tricep exercises for this goal. Most of these ladies end up targeting their medial and lateral heads when they should actually be aiming to target their long tricep heads. They tend to use a tricep pushdown movement when they should be using skullcrushers or tricep movements that better target the long head of the tricep. Although I do think this happens more often in this type of gym goers I see it plenty of other times in all sorts of gym types from novices to bodybuilders. One of the biggest problems with people and tricep training is they view it as training one muscle. 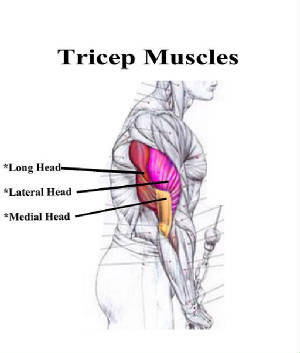 What people often forget is the tricep is made up of three heads. People never seem to have a problem breaking their shoulder training up into their three heads but often just lump a bunch of tricep exercises together and call it a day. It should not be about training your triceps but training your triceps to effectively achieve your goals. Because the triceps have three different heads, that and the exercises someone uses makes for a lot of variances of how someone’s triceps may develop. Some people may have well developed lateral heads but not so well developed long heads, or maybe well developed long heads but not so good development in the lateral and medial heads. The key is not to just do a few tricep exercises and call it a day but to pay attention to the area of the triceps you feel needs the most work and base a good tricep program around those goals. Like I stated earlier overall tricep development is about doing the exercises to effectively hit the parts of the tricep you want to hit. The key to remember with tricep training is all exercises are not created equal. Let’s now look at the three heads of the triceps and a few exercises that more effectively target each head. Now that we have looked at a few exercises and how they directly relate to each head, we should still train by the philosophy “Three heads are better than one!” You must remember the ultimate goal is still to build the three headed monsters. Once you assess which head you want to focus the most attention on, do not forget the other two heads still need their share of attention…maybe just not as much. Since triceps are smaller muscles you do not need endless sets and exercises to hit them. Four exercises should do the trick to really hit them. Sets can be anywhere from 2-4 per exercise. Smaller and less experienced trainees should use less exercises while larger and more experienced trainees can use more volume and exercises. The best way to put things together for all around tricep development would be to perform two exercises that target your weakest head first and then one exercise each for the two remaining heads. By doing this not only are you specifically targeting your weak head but you are also not neglecting your other heads either. When worked the right way the tricep muscle can be quite the three headed monster. 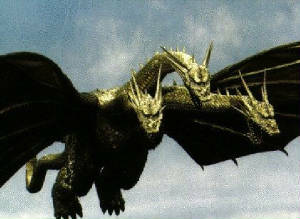 The problem is a lot of people do not train the three headed monster as optimally as they could. By paying more attention to each individual head and what it needs in terms of training people can obtain much better overall tricep development. While it is important to focus a little more attention of the weaker tricep head all heads should still be continually trained for optimal overall development. By getting more specific with your tricep training you’ll have three headed monsters in no time. Check out more training articles in the past articles section.